Contrary to stereotypes, golf can be quite hard on your body, especially if you play frequently. You may not be subject to jarring hits like you are in football and hockey, but golf is the type of activity that takes its toll on you one swing at a time, hole after hole. The bending and twisting motion of swinging your club can wreak havoc with your back over time as well as the neck, shoulders, wrists, knees and lower extremities; the repetitive nature of the golf swing can lead to muscles and joints getting torn, strained, and sprained. As with any sport or intensive physical activity, there are precautions you can take to prepare your body to withstand these types of hazards. 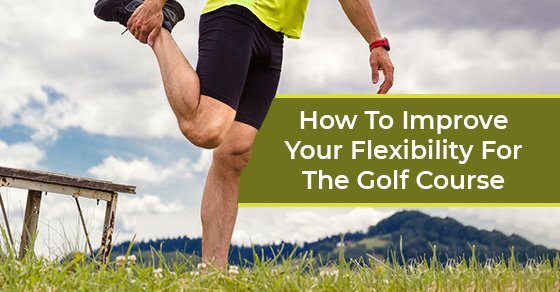 With respect to golf, it’s especially important to maintain a high degree of flexibility; this will not only help you to minimize certain types of injuries, but it’ll also help you improve your overall performance out there on the course. Below are some golf stretches that will not only benefit you when you’re teeing it up, they will also help improve your overall flexibility. Before doing any of these stretches, make sure that you have warmed up for 10-15 minutes beforehand. While also preventing your muscles from freezing up, you’ll find that a quick warm-up will help you accomplish deeper, more effective stretching. Stretch Your Hip Flexors Step your right leg forward and lunge while your left knee is locked. Now, gently twist your torso as far as you comfortably can to the left, making sure that your lower body doesn’t move. Hold the position for a few seconds then release. Repeat this 5-7 times then do the same, this time stepping forward with your left leg and twisting your torso to the right. Shoulder Rotations Shoulder pain is a common problem for competitive golfers, and doing shoulder rotations can be a huge help. Begin by standing with a hip-width distance between your feet. Keep your shoulder blades down and place your hands on your thighs. Keeping your neck still at all times, slowly rotate both the shoulders in a clockwise direction 8 to 10 times, and then rotate them counterclockwise about 8 to 10 times. Supported Twist and Bend Place a golf club on your shoulders with your hands on either side. Make sure your feet are slightly more than shoulder-width apart. Gradually twist to the right side and then bend down as though you were trying to reach your head to the right knee. Come back up and to the starting position and repeat the same on the other side. Repeat this stretch 10 to 12 times on either side. Squats In addition to improving flexibility, squats increase both your heart rate and the blood flow to the lower part of your body. Begin by placing the golf club in front of you with your hands extended straight out. Bend your right leg and place the ankle of the right leg on the left thigh. Now slowly come into a squat, until your left thigh is parallel to the ground, then come back to the starting position. Repeat this exercise 10 to 12 times, then switch legs. Chest Stretch Chest flexibility is also extremely important for golfers. To work and stretch your chest muscles start by standing with your feet hip-width apart. Next, extend both your hands behind you. Bring the shoulder blades closer to one another and straighten your arms. Now, try to intertwine the fingers and bring the hands in level with the shoulders without leaning forward. Hold this stretch for 10 seconds, let go, then hold the stretch again for another 10 seconds. Lying Lumbar Flexing This should be done lying on your back, with your knees bent up so that your feet are flat on the floor. Take hold of both knees and pull them up towards your chest. Alternately, if you have pain in your knees, try grabbing the back of your thighs instead. Hold for 30 seconds while breathing normally, keeping your neck and shoulders relaxed. Seated Twist Sit on a bench or golf cart with your knees together and feet flat, pointing forward. Reach across the front of your body and grasp the back of the bench or cart; this will stretch your spinal muscles. Hold the position for 15 seconds. Repeat twice on each side. Quad Stretches These are very simple to do and are an ideal way to loosen your muscles just before you tee off. Remember, the more you can use your legs in your golf swing, the more power you will generate. Bend your knee and pull your shoe towards your bottom. Hold for 10 seconds and do the same to the other leg. While you’re doing this rotate your torso to the right or the left, mimicking your golf swing. Wrist Stretches The wrist is one of the most important body parts in golf, and one of the most neglected. While flexing them while putting is a big no-no, not flexing them during your backswing will cost you considerable distance. To keep your wrists loose, make a point of gripping the tips of your fingers on your right hand with your left hand, and pull back as far as possible. Hold for 10 seconds and do the same on the left side. By following a regular stretching routine you will not only relax important muscle groups, but you’ll increase your body awareness enabling you to maintain a more consistent swing pattern. This will benefit your golf score while making sure that your body is not wracked with pain afterwards. For more information on how to keep fit for the golf course, contact Physiomed today.